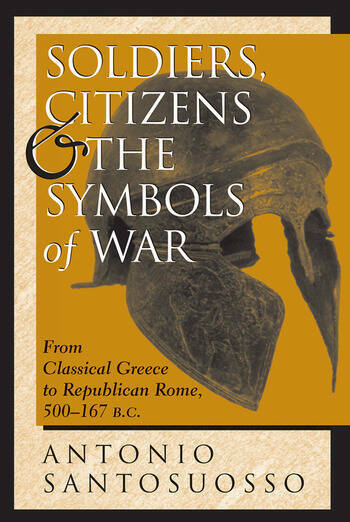 Soldiers, Citizens, And The Symbols Of War: From Classical Greece To Republican Rome, 500-167 B.c. In this comprehensive overview of ancient warfare, Antonio Santosuosso explores how the tactical and strategic concepts of warfare changed between the beginning of the fifth century b.c. and the middle of the second century b.c. and why the West?Greece, Macedonia, and Rome?triumphed over the East?understood geographically as Persia or ideologically as Carthage. He also shows how the role of warrior related to the role of citizen and how the symbols and propaganda stemming from war emphasized and promoted the values of Western societies.When considering the evolving role of the citizen as warrior, Santosuosso finds that these roles were indistinguishable from each other in the earlier stages of classical Greece. The Peloponnesian War, however, challenged this system by introducing new army types, such as mercenaries, peltasts, and light infantry. Soon after, Macedonia introduced the cavalry, thrusting it, along with heavy infantry, into a place of prominence and diminishing the complementary roles of citizen and warrior typical of earlier times. Later, the advent of the Roman legion continued this evolution, altering again the place of the citizen in ancient society.Rich in analysis, Soldiers, Citizens, and the Symbols of War is a valuable and accessible source for students of ancient warfare and classical society and provides thorough coverage of the major battles of antiquity?Marathon, Thermopylae, Salamis, Plataea, Sphacteria, Leuctra, Granicus, Issus, Gaugamela, Synoscephalae, Pydna, Trebia, Cannae, Ilipa, and Zama.